staytonevents.com is a local promotional service and website that works directly with you to help promote your activity, event or business. We do not take information from Facebook or other publications. We must have direct email communication with one of your event's organizers in order to provide full, accurate and effective promotion. Please be prepared to communicate full information openly with us, and respond to our questions. Our promotion of your event is not a one time first of the month print it and forget it "ad" but rather an ongoing campaign that builds through the event date. Our climbing calendar focuses more attention to your event as it climbs to the top. The promotional service of staytonevents.com is an evening and weekend community service project. In addition to our free PSA's, some promotions are subject to our base promotional fees, promotional sponsorship agreements, promotional event booth space, other quoted agreement or a combination. All events are unique in their organization, scope and purpose and are considered individually. Please read the information below and then send us an email at staytonevents@wvi.com with full details of your activity, event, inquiry, or scope of your business advertising needs, and we'll get back to you. We do not take information from any other sources. Please include all available event documents and flyers as attached original file, or pdf files saved from original. Please contact us as early as possible, preferably in your event planning stage. Make sure our email address staytonevents@wvi.com is added to your contact list so our replies go to your inbox. Public Service Announcements: staytonevents.com provides free PSA's on the Local Area Calendar of Events for a variety of Government and organization meetings, most student activities (sports schedules, plays, concerts, car washes, bottle/can drives.. etc. ), as well as many other public service and civic activities. To be considered for PSA posting you must send full details and description of your function by direct email. Once we have received your full info, and consider it within the scope of free PSA's, we will compose and publish the posting. If it is considered outside the scope of free PSA's, we'll get back to you. Understandably, we typically will not provide a free PSA, or donated promotion, for any event that is paying for promotion through any other media, including Facebook. *We are happy to post any local organizations meetings for which we are sent notice, and encourage you to contact us. Specific notice must be sent to us with accurate meeting details. We will post up to three months or so of reoccurring meetings in advance, but it’s up to you contact us to request continued posting blocks (so we know if it's still happening or there has been any changes) to stay on the calendar. We will never continue to post anything perpetually on our own without updated contact. There are a lot of local organizations and schedule changes, it's impossible for us to accurately be anyone’s schedule keeper without contact. 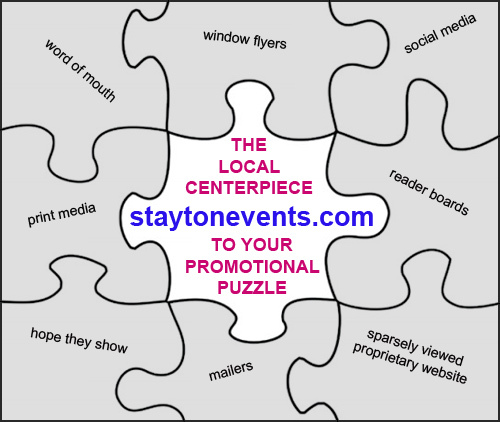 Spotlight Promotions: staytonevents.com offers full online promotional services at community friendly rates to help your organization or business get the most out of your major fundraising or promotional event. Spotlight Event promotions on our Local Area Calendar of Events, event Display Ads - Page Top Banners - Online Ticket Sales... (and now some onsite help>>) any or all are available to help your event be more successful. To get started just send inquiries and full details and description of your event by direct email. We'll get back to you and let you know how we can help you. *Yes, you can choose to have your eligible free PSA upgraded to a Spotlight Event promotion. Many people do for the great promotional value! Business Advertising: Spotlight Event calendar promotions (Grand Openings, Open Houses, Anniversaries..etc) and column Display Advertising is also available to local businesses. To get started just send inquiries, or the scope of your advertising needs, by direct email and we'll get back to you. 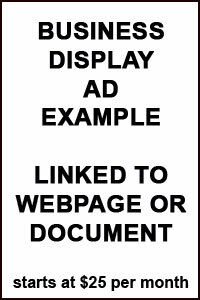 Garage Sale Advertising: Full information highlighted garage sale ads are available for only $5. Click or scroll down for more information and to purchase an ad. The staytonevents.com Stayton Area Calendar of Events is a climbing calendar. All events are posted on the calendar date they occur. Each morning, yesterday is deleted from the calendar and remaining events climb to the top. $45 - Full Spotlight Event/Event Display Ad & Graphics combination. Email For Quote - Multiple Similar Reoccurring Promotional Events, Custom Ads or Postings, Other Promotional or Advertising Services or Ideas. Just let us know what you need. Send Your Community Event Information to staytonevents@wvi.com . Please read these guidelines. Full event information, description, links to registration forms etc.. Updateable at any time details or schedule of your event or activity may be subject to change. All information must be kept current. We compose promotional copy for publication from your supplied information. Example Eligible Free PSA Title, time, Full Address. Full event or activity details and descriptive information. Who, what, when, where, why and how much at a minimum. Plus answers to our questions we might ask you. We compose wording for publication from your supplied information. staytonevents.com is an evening and weekend public service project. Any promotional or advertising fees that may be charged are set at minimal rates to help make sure anyone can afford the promotion they need but we also get something to help cover costs of our community promotional services. Our basic fees do not reflect the far greater real world actual value of the promotion. When we offer free or reduced rate promotion as a Promotional Sponsor, we expect that agreement in return to reflect the actual comparable value we are providing. Staytonevents.com reserves the right to determine whether submitted information qualifies for free posting as a Public Service Announcement or if it is promotion subject to our base promotional fees or agreements. staytonevents.com reserves the right to edit or not publish any submission. staytonevents.com is not responsible for errors, omissions or schedule changes that we are not notified about. Your posting will be updated whenever current or corrected information is provided. This website is an evening and weekend project. We are unable to respond to emails during the weekday. The site is updated at least once a day. Need to make your payment online? Ask us to place your invoice number here. All transactions are securely processed by PayPal but you do NOT need a PayPal account. staytonevents.com will not receive, or have access to, your credit card information. Full information highlighted garage sale ads are available for only $5. 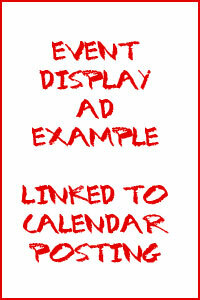 Local garage sale ads are placed on the staytonevents.com calendar of events on each day they occur. Garage/Yard/Rummage sale ads on the staytonevents.com calendar are available for only $5 (does not include commercial or home business sales). Serving the Stayton, Sublimity, Aumsville, Turner, Scio, Lyons, Mill City, Gates, Detroit and the Santiam Canyon area. Ads should be submitted in advance and will be displayed on the calendar for each day of sale, up to four consecutive day maximum sale. To purchase a garage sale ad, use the button below for online payment, then email your full sale information (full address, all dates, hours, description) to staytonevents@wvi.com with your sale street address in the email subject line. Your ad will be published the same evening received. Make sure our email address staytonevents@wvi.com is added to your contact list so our replies go to your inbox. staytonevents.com reserves the right to not post any inappropriate submission. Your description here: of all the really cool stuff you have to sell. Want to consider online ticket sales on staytonevents.com for your event? Review this ticket sale request/agreement form>> and then email us at staytonevents@wvi.com to discuss the scope of your event. Inquiries should be made during your event planning process. Invite us to a planning meeting! Any nauthorized use, including republishing content in any manner, is strictly prohibited.